The Blue Fuji restaurant at 200 Great Road opened last month. The new restaurant replaces Asiana Bistro which closed in August. 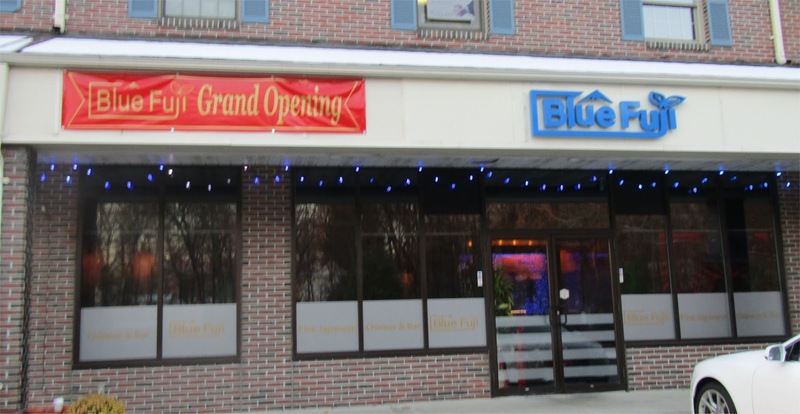 Blue Fuji has an additional location in Medford. I recently spoke with Chris who is the manager for the Bedford location. 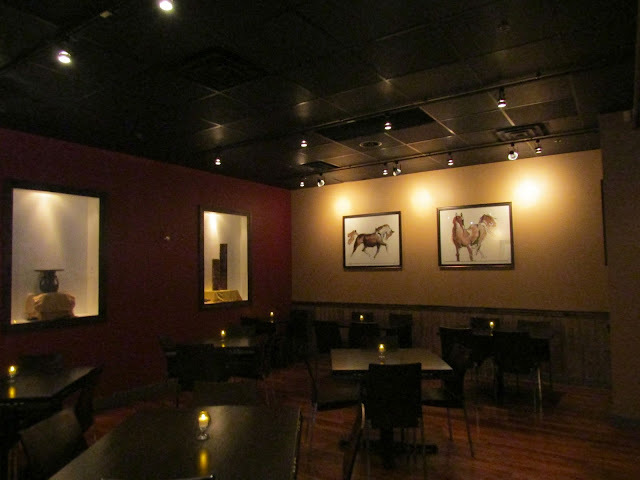 The main dining area has been completely redone from when it was Asiana Bistro. 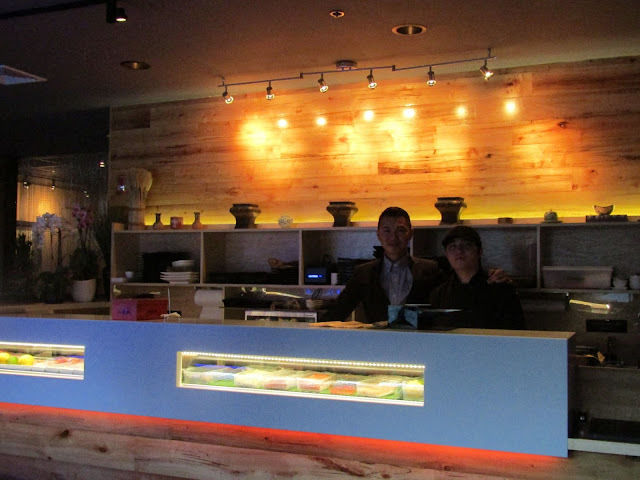 According to Chris, Blue Fuji focuses on organic Japanese and Chinese cuisine including "Fusion" Sushi. 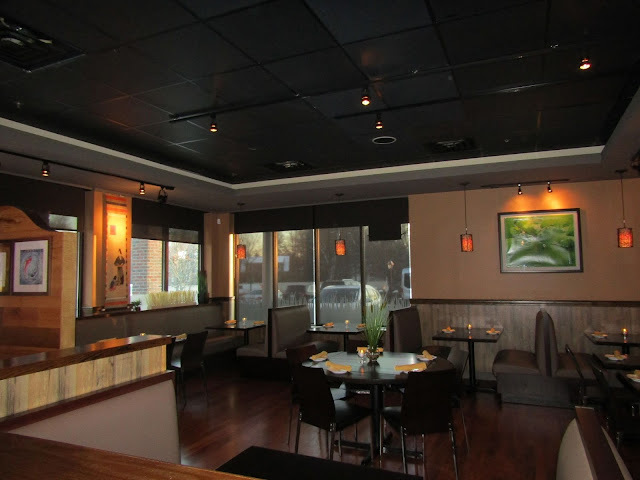 While the menu is similar to their Medford location, the Bedford restaurant has added a bunch of new items such as Sushi with organic quinoa rice in place of the standard white rice. The restaurant features 88 seats spread across several dining rooms. The new restaurant has undergone a complete renovation. 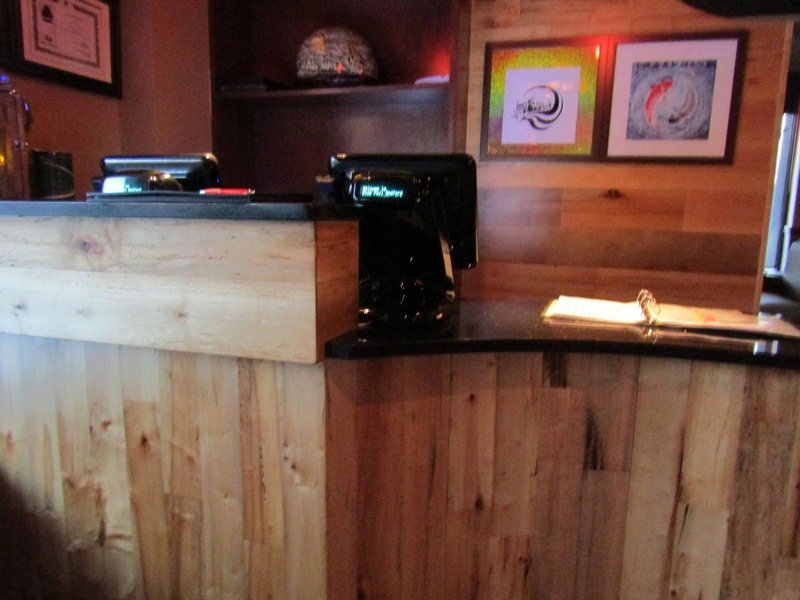 The extensive wood work gives it a interesting rustic feel. The decor at the Bedford location is very different from the decor in Medford. In addition to the standard items, the Sushi bar features a wide assortment of special Sushi Rolls. Chris mentioned they really love the Bedford site. They think the town is great and the location being adjacent to Lexington and Concord is ideal for attracting new customers. the most requested bar drink is a Mai Tai. According to Chris, all of the management staff which includes the head chef, have around 20 years experience in the restaurant industry. They currently have about 20 employees. room for up to 45 people. In conjunction with their regular menu, Blue Fuji also offers weekday lunch specials. 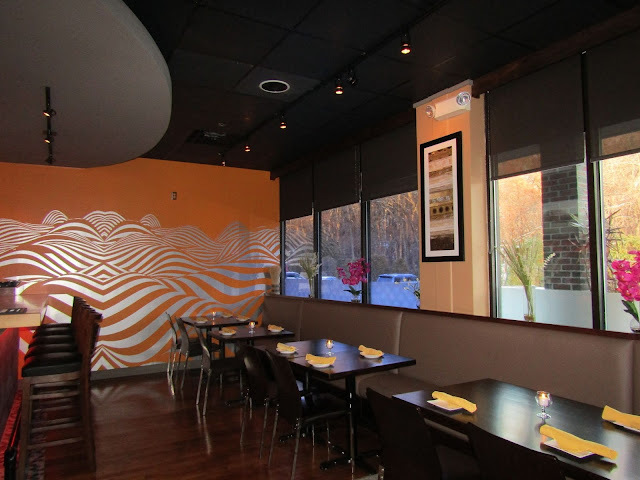 In addition to takeout, the restaurant also offers online ordering, delivery and corporate catering. that are several hundred years old. Chris has been pleased with the grand opening and mentioned that many of their initial customers have already returned. They are interested in working together with the community and hope many will come and try their food. 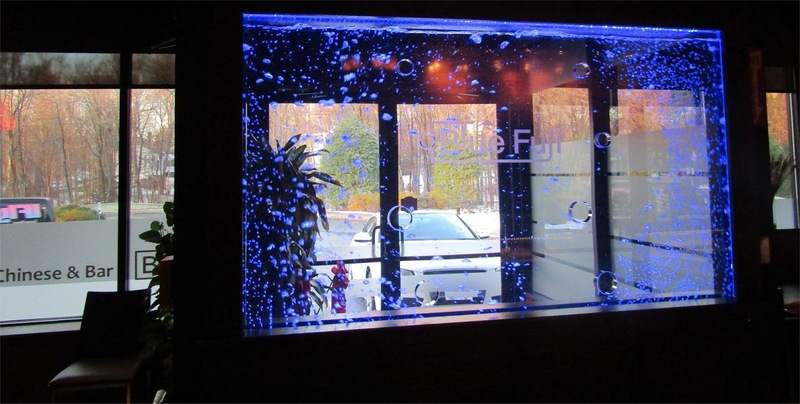 Customers encounter a Bubble Wall upon entering the restaurant. The restaurant is open Sunday through Thursday from 11:30 am to 9 pm and 11:30 am to 9:30 pm on Fridays and Saturdays. It will be interesting to see what impact Blue Fuji has on Ginger and The Great Wall. 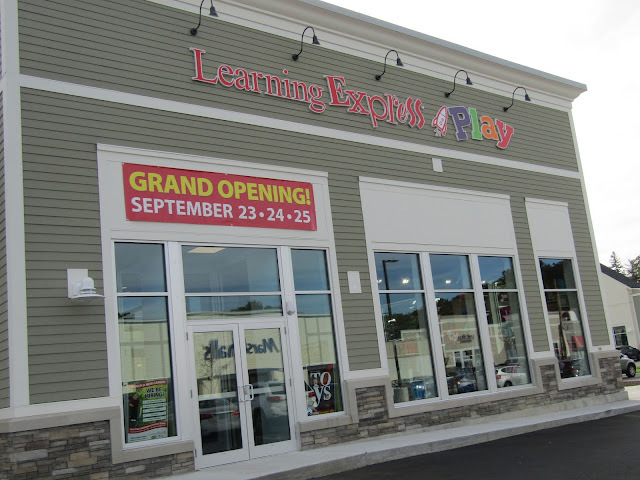 Learning Express Toy Store and Play Center located at 168 Great Road in Bedford Marketplace is now open. 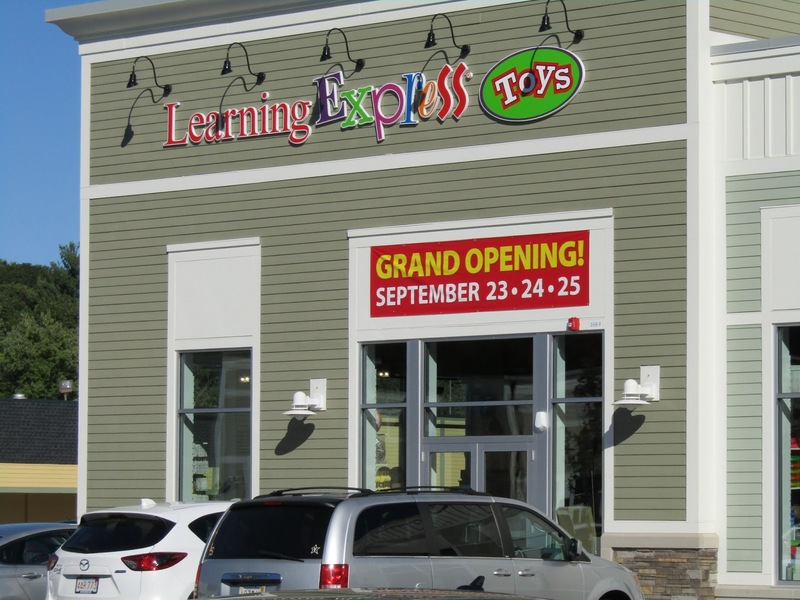 The new concept, which combines a toy store with children’s activity center and play museum is the first of its kind for Learning Express which operates over 125 toy stores across the United States. The company got its start in 1987 with its first store in Acton Massachusetts. 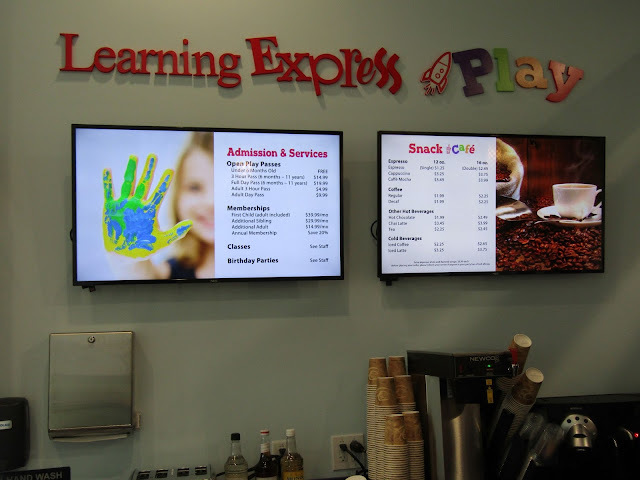 I recently spoke with Learning Express Marketing Director Lauren Derse. Lauren explained that while its stores are normally franchises, this is a new concept so the Bedford location is their first company owned store. 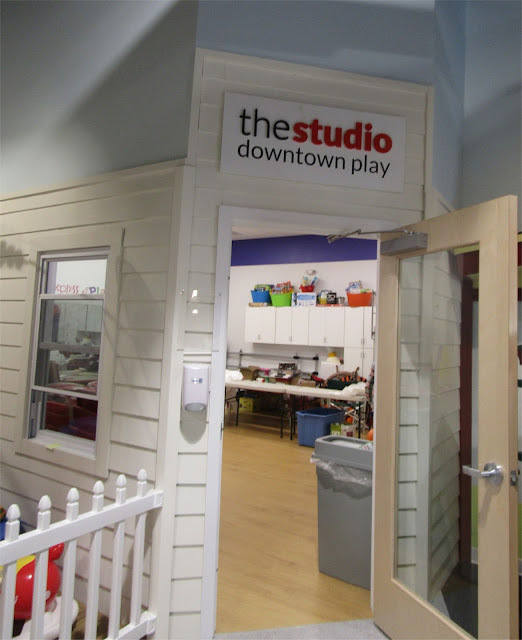 The new space consists of 7500 square feet divided between a traditional toy store and play space known as Downtown Play. The downtown play space includes lots of miniature stores and outdoor items. 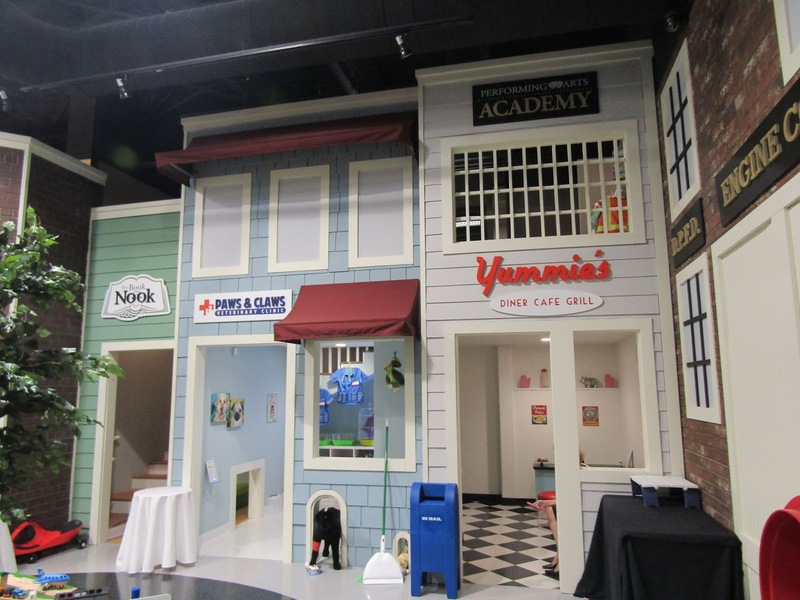 The downtown play space consists of ten themed play areas fashioned after a traditional New England town. The play area includes a general store, veterinary clinic, performing arts center, 1950's diner, gymnasium with a rock-climbing wall, an infant play area, a fire house and more. 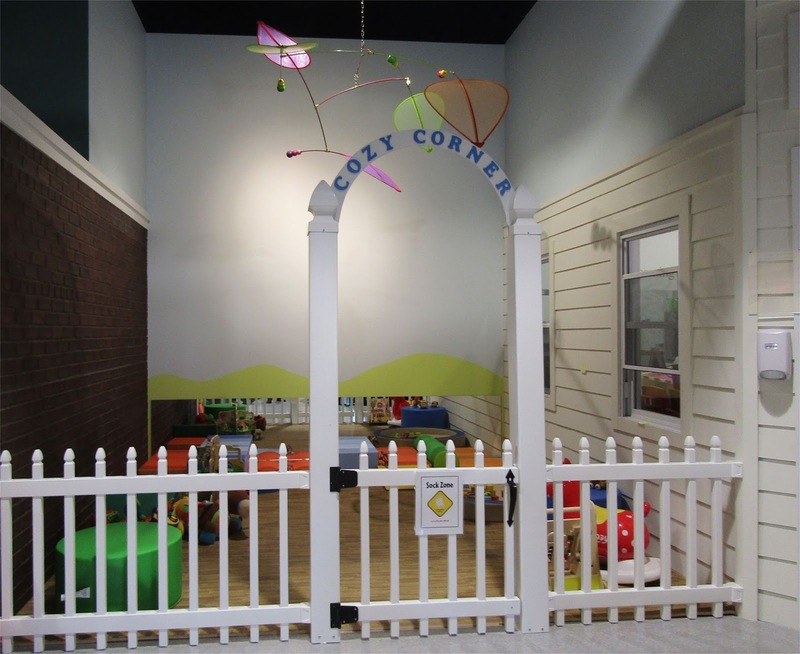 The play space is designed for kids ages 6 months to about 8 years. The studio features 45 minute classes focusing on movement, dance, art, music, science and more. 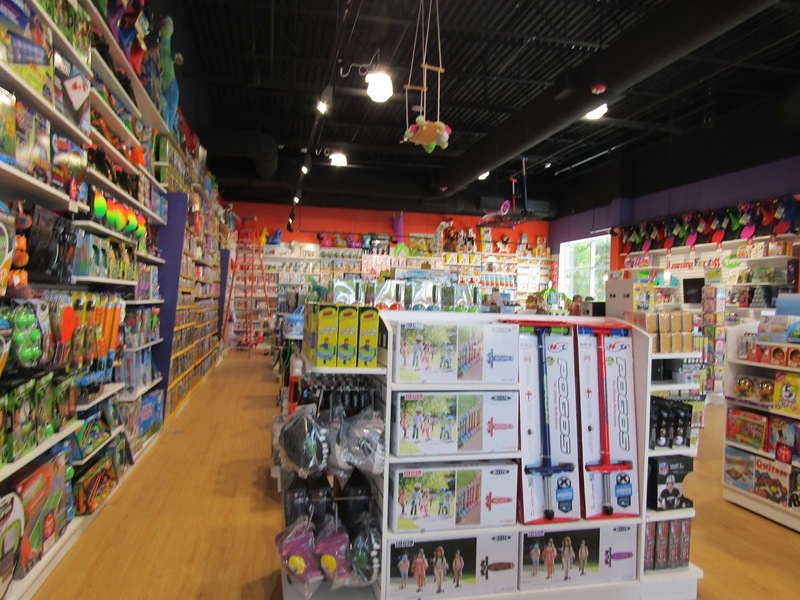 Lauren explained that while the business has been around for almost 30 years, the retail toy industry has undergone a lot of changes resulting in a lot of mom and pop toys stores closing down in the last five years. The infant play area is designed for babies that are not yet able to walk on their own. With the shift to online sales, Lauren explained that Learning Express really want to focus on the experiences that can only be achieved by visiting a store. 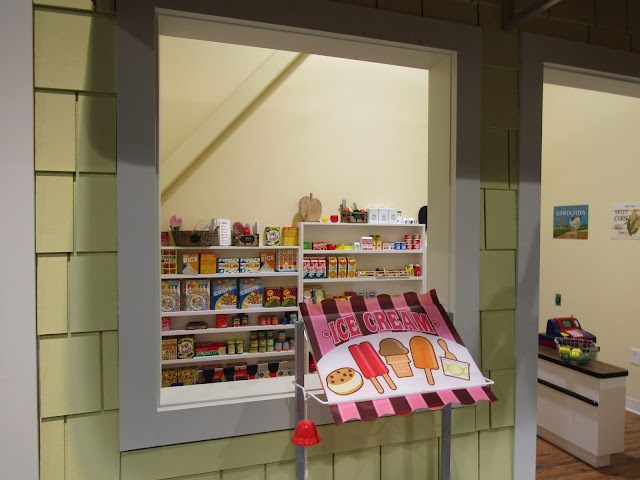 The general store is almost a full replica with working shopping carts and a functional cash register. The general concept is parents pay $14.99 per child for up to 3 hours of what is known as open play in the downtown play space. While a parent must stay near the child for open play, there is no cost to the parent. With the location in the Bedford Marketplace, Lauren envisions many cases where one parent stays with the kid while the other parent gets some shopping done. 2nd floor view from the downtown place. Note the slide for kids to ride down to the first floor. In addition to open play, they also offer a dozens of different classes designed for Children broken down by age. 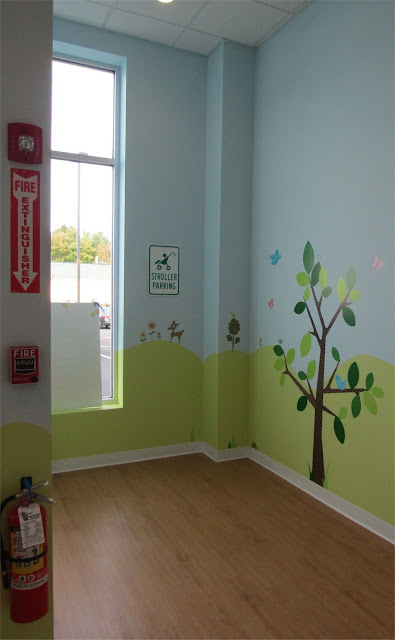 Each class is 45 minutes and is provides an environment for kids to explore and discover. Each class repeats weekly and are available on a monthly plan, you can trial a class for free. 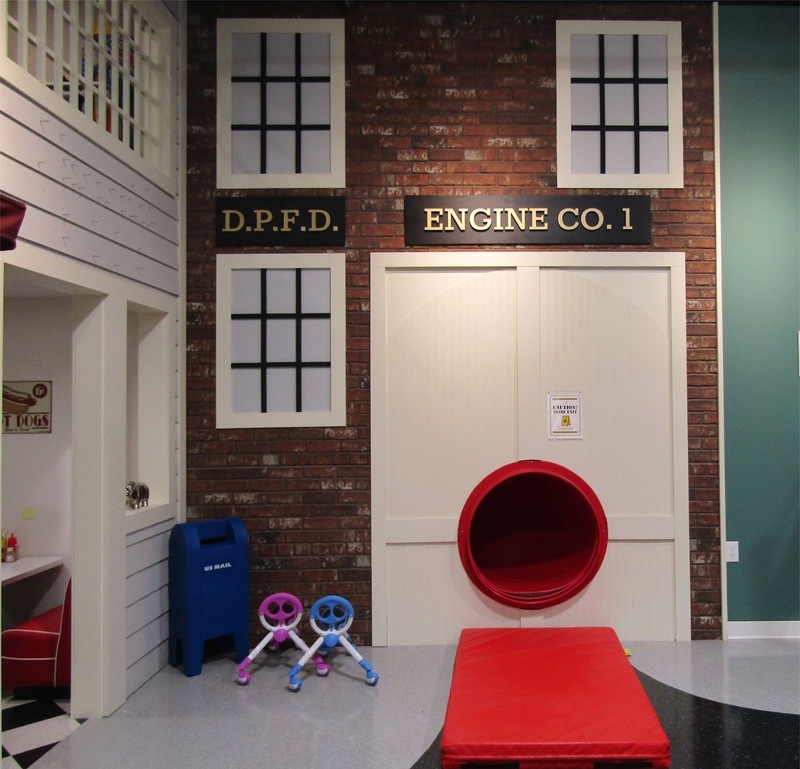 The slide exits out of the fire station..
Lauren also mentioned that down the road they will offer a three hour date night program where a couple can drop off their child and then head out for dinner and more. As part of the program, they are looking to partner with other businesses in the Bedford Marketplace (for example a special promotion for an appetizer with dinner). The play area includes a tiny train station. Note the colors match those at Depot Park. 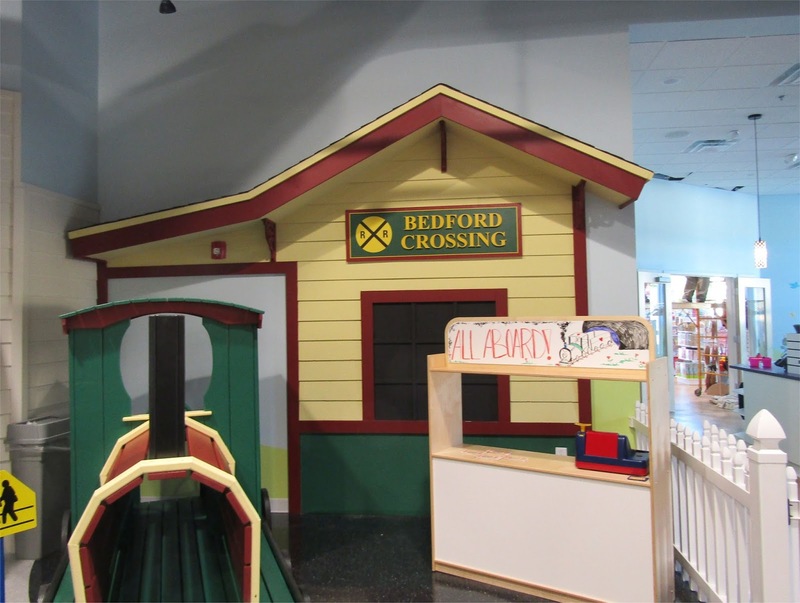 Lauren commented that Learning Express really liked the location in Bedford Marketplace and Bedford has a high percentage of kids which fits their demographics. They've been out in the local community for the past few months and they really love the town. 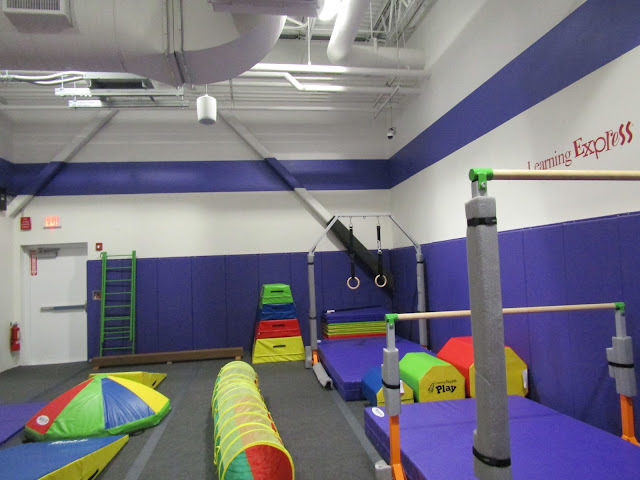 The Gymnasium is nearly 1000 square feet and has dozens of activities. The new play center will also do Birthday parties. Each party includes 90 minutes of 'facilitated' fun with cake followed by one hour of open play. 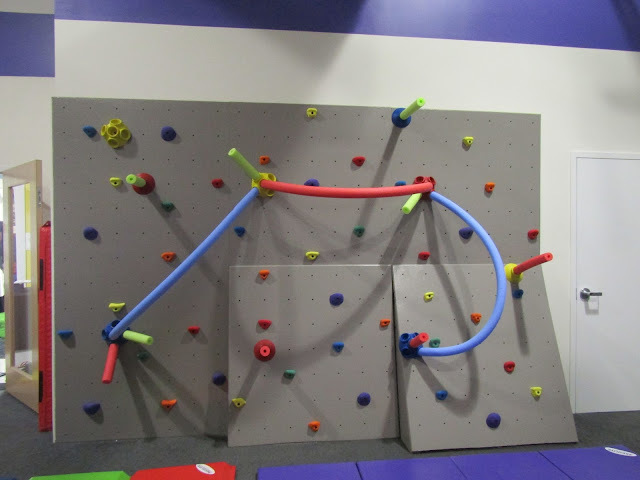 The gymnasium also features a mini rock wall. Between the play space and the toy store is a snack cafe. The food is provided through a partnership with Prince Street Cafe. The kids menu focuses on organic snacks and the food items do not contain peanuts. 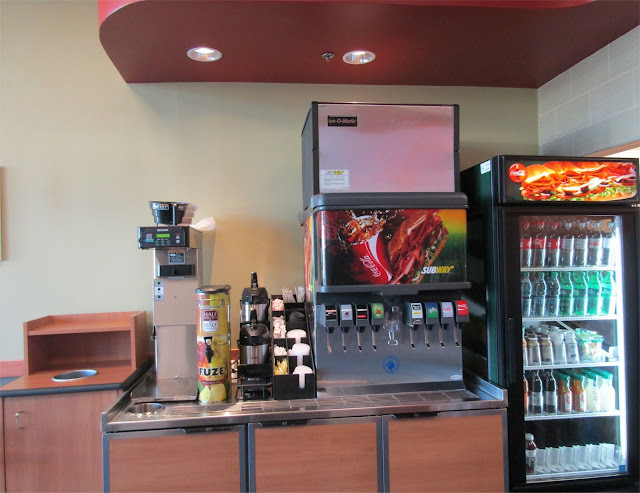 For adults there is a selection of Yogurt, Coffee and other beverages. The cafe will be open whenever the open play is open. The toy store is modeled after other Learning Express toy stores with a focus on products that promote childhood development such as Melissa & Doug. Finishing touches were being made as the store readied for its grand opening..
Lauren remarked that while they are all very excited about this new concept, this will be a experiment for them. The company overall will be working closely with the Bedford store to gather lots of feedback and making adjustment as needed. Once they get it working well the hope to replicate it in other locations. 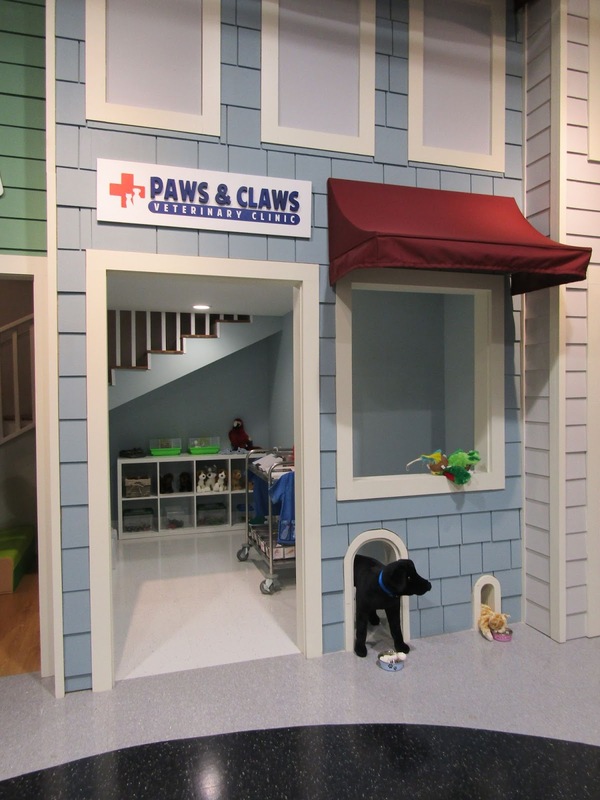 The Paws & Claws clinic features stuffed animals for kids to practice on as a Veterinarian. The Grand opening for this new concept runs includes special guest for kids such as Elmo, Peppa from Paw Patrol and Cinderella. They also plan to features contests, raffles and special promotions. Lots of stroller parking is available. Learning Express is open from 10 am to 9 pm Monday through Saturday and 9 am to 7 pm on Sundays. 1. While Learning Express is now just opening, they have already been involved in the community for many months. It's good to see a company make the investment. 2. It's interesting that Bedford was once again chosen as the location to test a new concept for an existing company. Panerea Bread did the same thing two years ago with its takeout and delivery concept. 3. If the concept is successful, I predict it will be a big driver of traffic for the Bedford Marketplace and be very beneficial for the other businesses. Overall it seems the Bedford Marketplace renovation will be successful. There are only a few vacant spaces left at the Bedford Marketplace and those are under discussion to be leased. The Bedford Subway has reopened at 158E Great Road in Bedford Marketplace between b.good and Simply Nails & Spa. The restaurant, which closed last October for the Bedford Marketplace renovation, had it's soft opening on Wednesday. The new seating area incorporates art work, LED lightning and a mixture of seating styles including high tops. I recently spoke with Harry one of the owners. 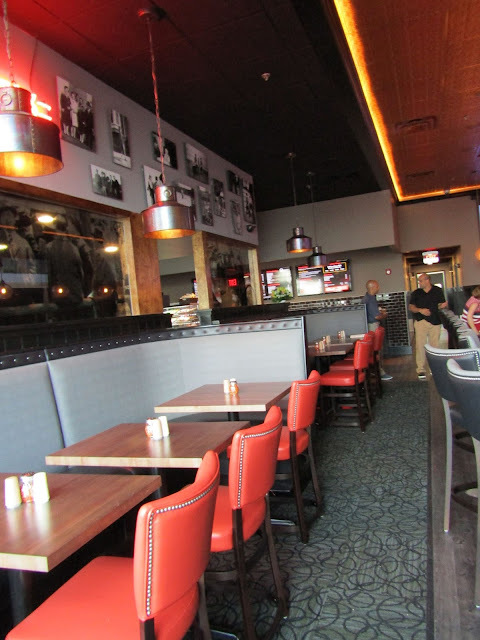 According to Harry, while the new location has 18 seats just like the old location, it's features a totally new interior design known as Metro Decor. 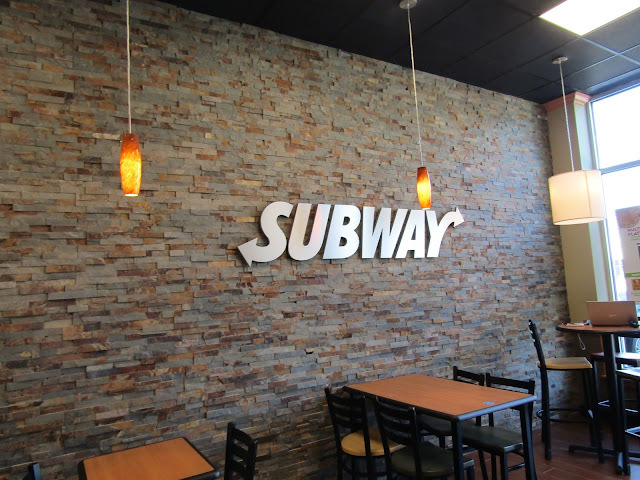 The focal point of Subways Metro Decor is the stone wall displaying a metal version of the iconic Subway logo . The high ceilings give it a more spacious feel. While Harry is happy to be in the new space, he's more excited that a good portion of his original employees choose to come back to his store. 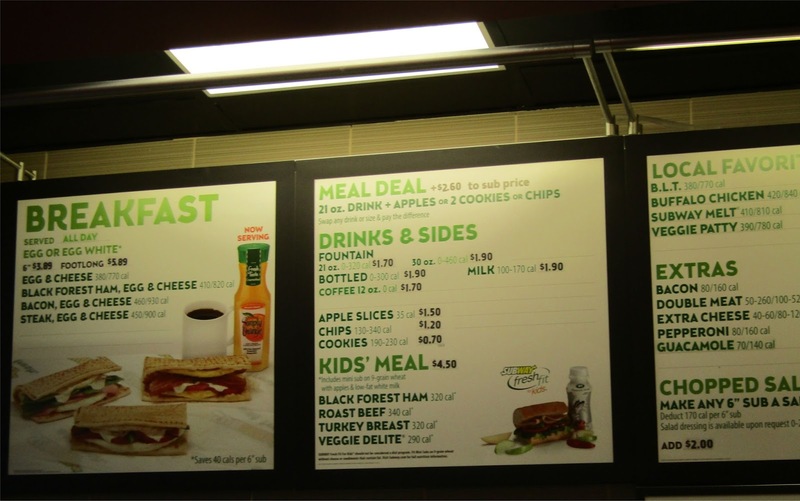 While many people think of Subway as a lunch place, they also offer a variety of all day Breakfast items. Note the menu board now list calories which will be a FDA requirement on May 5, 2017. While most of the menu is carryover, next week the restaurant will be introducing wraps which are only currently available at a small percentage of Subway locations. The restaurant offer both self service and bottled drinks. The checkout station has added new payment methods including Apple Pay and through the Subway App. Harry mentioned these have become quite popular. 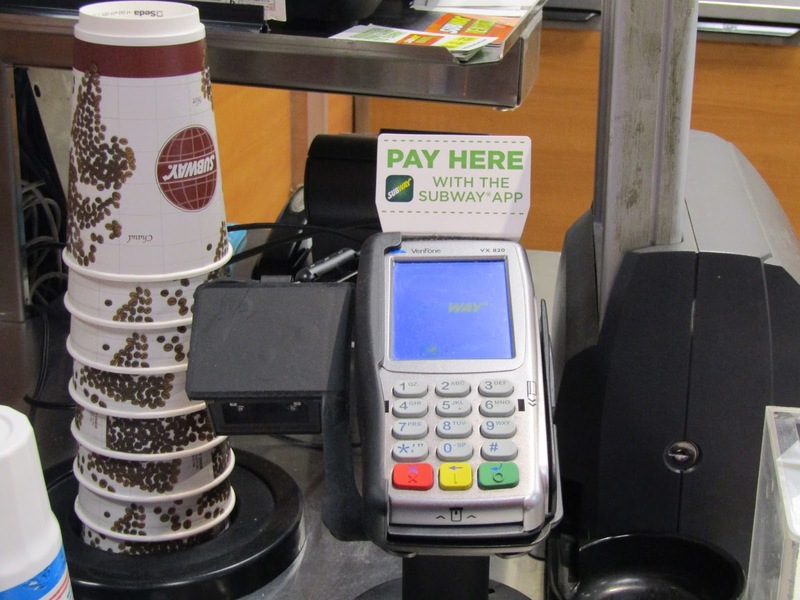 The new Point of Sale system has contact less options. 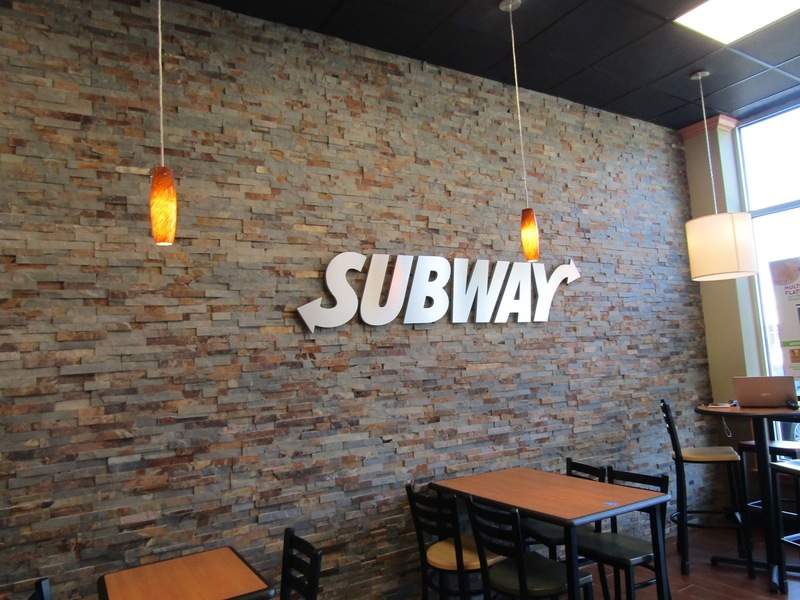 Subway has the most locations of any restaurant with over 26,000 in the United States and 44,000 world wide. In August, Subway unveiled a new logo as shown below. The new Subway logo is on the bottom. Initially only new locations that open after 2016 will use the new logo. The rest of the stores will be Grandfathered with the older logo for a while. The new restaurant is open from 7 am to 9 pm Monday through Friday and 9 am to 9 pm on Saturdays and Sundays. Harry expect a more formal Grand Opening in the next few weeks. With Subway opening, Bedford Marketplace now has six restaurants (eight if you count Whole Foods and the snack counter at Learning Express). There has been some talk of adding one more restaurant but that is still up in the air. An update on Bedford Marketplace. 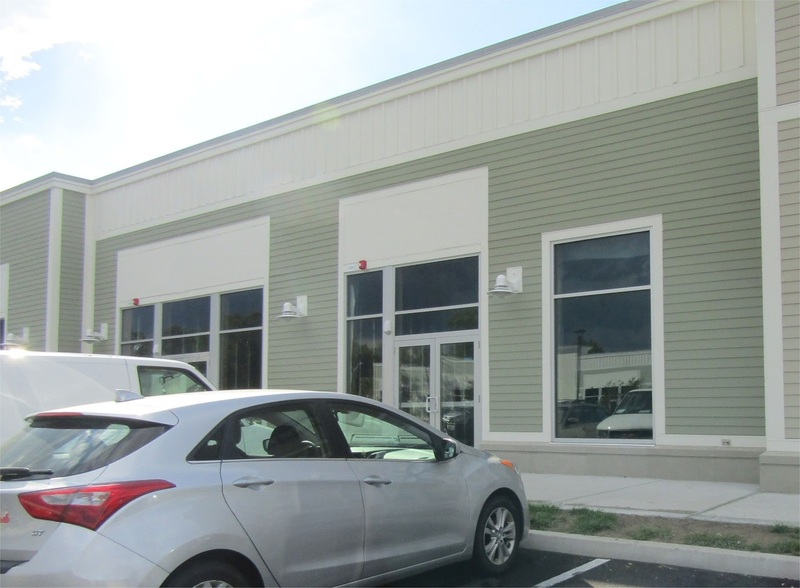 The Bedford Post Office has signed a lease in the space next to Bruegger's Bagels & Jamba Juice. This will be the retail space for the post office and is expected to open by February. This will replace the two temporary trailers near Red Heat that the post office has been operating out of since last September. Currently there are no plans to bring a local distribution center back to Bedford. Mail to and from Bedford will continue to be sorted at the Burlington mail distribution facility. This is expected to be the permanent location for the Bedford Post Office. 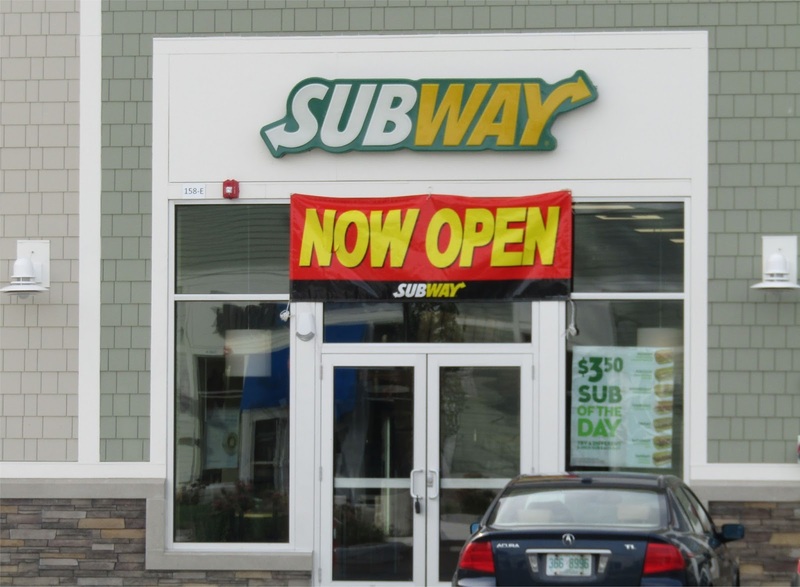 After some delays, Subway is finally expected to open in the next few weeks. This will be the fourth restaurant on the block. Now hiring signs and a opening soon banner have gone up. Simply Nails & Spa recently had it's grand opening. 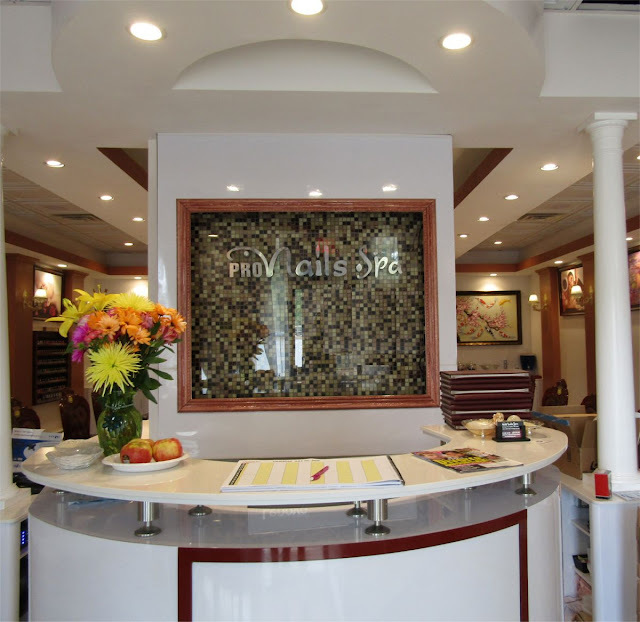 The Spa has an additional location in Cohasset MA. The Spa opened September 9th and is still celebrating their Grand Opening. Construction work has been completed on Learning Express Toys. This Flagship store will include a new concept called Learning Express Play. This will include a children’s activity center and play museum for children ages 6 months through age 8. This store is expected to open on September 23rd. Stay tuned for more details. While Learning Express has over 120 location, the Bedford store will be the first to include a 1,000-square-foot children’s gymnasium with a rock-climbing wall. As previously reported, Brookline Bank moved in to their Permanent location on September 12th. The Bank is located at the very front of the Marketplace. The space runs across an entire block on Great Road. 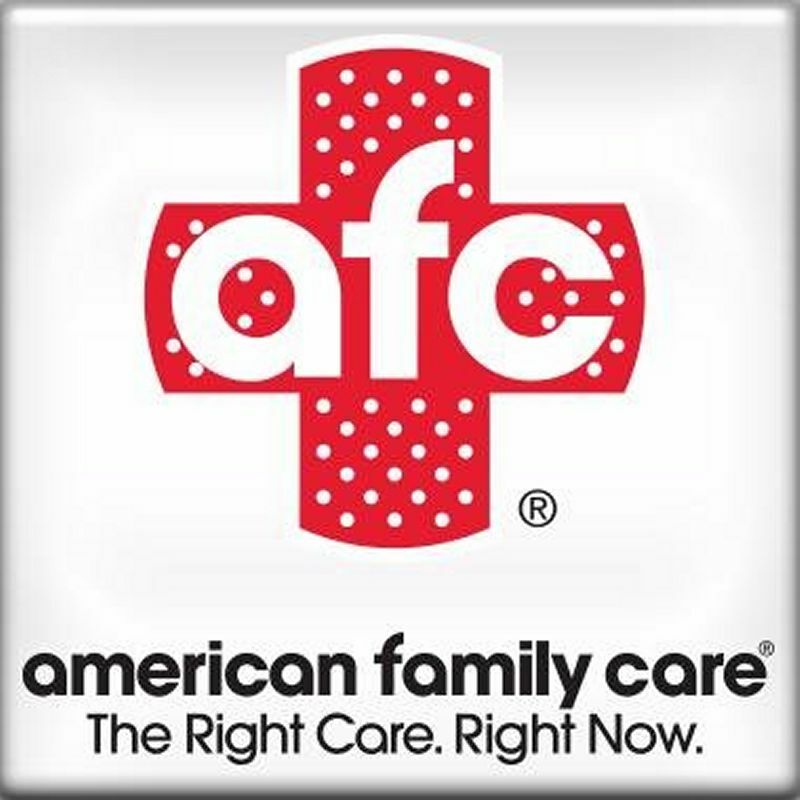 American Family Care will be opening a Bedford location of their Urgent Care & Walk in Clinics at 154 Great Road which is located between Red Heat and Lincoln Liquors. 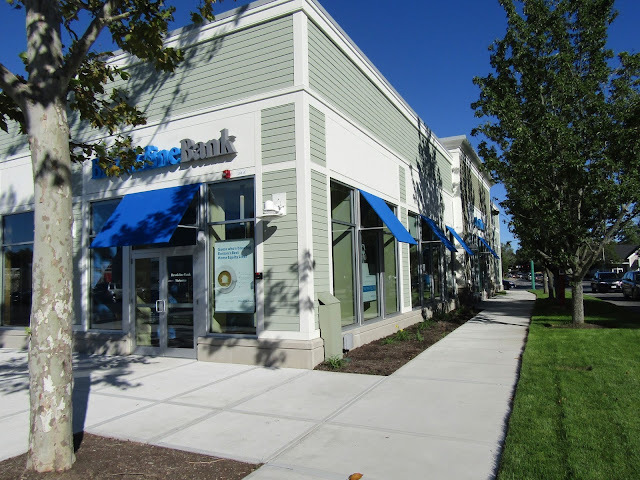 This space was the temporary location of Brookline Bank. American Family Care currently operate over 160 urgent care clinics across the United States. The Bedford location is expected to be open 7 days a week. Interior work for the new clinic is expected to start shortly. Now that most of the rented spaces are now open and most of the reconstruction and landscaping of the Marketplace has been completed, it seems like it would be a good time to hold a Grand Opening celebration for the entire Bedford Marketplace. There are still about a half dozen retail units still available for lease in Bedford Marketplace. What type of stores would you like to see added to the Marketplace? 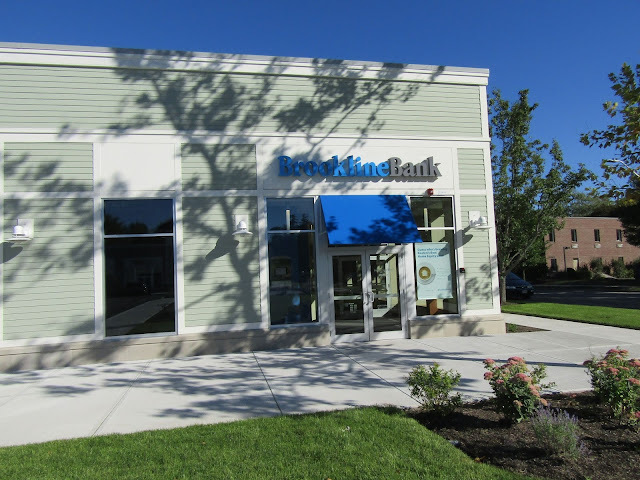 The Bedford Branch of Brookline Bank has moved to it's permanent location at 168 Great Road in Bedford Marketplace. 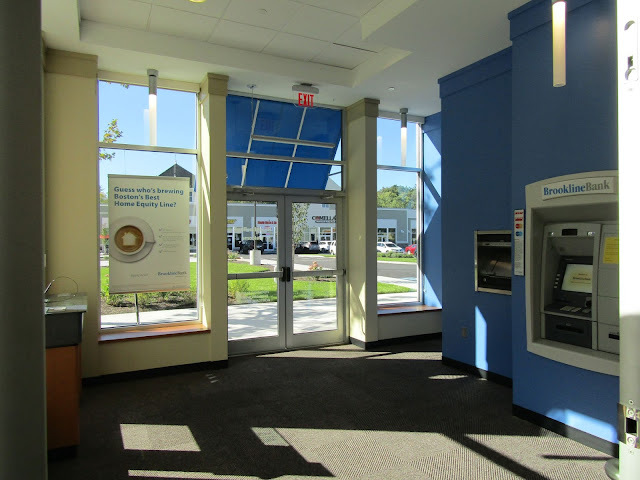 The Bank moved to a temporary location next to Red Heat last October while a new building was being constructed. The bank is the first tenant to open in this building (Learning Express is scheduled to open later this month). 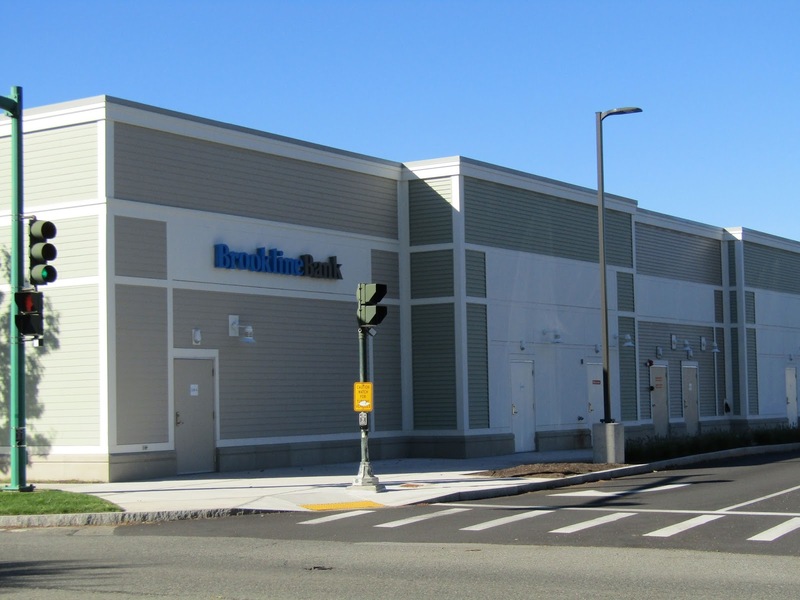 Similar to Bank of America, Brookline Bank has a corner location with frontage along Great Road. I recently spoke with Assistant Branch Manager Karyn Carter who has worked at the Bedford branch for over 13 years. According to Karyn, they are very glad to be back in their original location in a new building with additional exposure on Great Road. The new lobby is much more spacious and inviting. To celebrate their new location, Brookline Bank is having a Grand Opening Week starting on September 19th. According to Karyn, the bank is providing a complimentary continental breakfast each morning along with a daily raffle. All the raffle prizes are for other merchants in Bedford Marketplace. A sign just outside the Bank promoting their grand opening. While the Bank has vacated it's temporary space, it will be leased to AFC Urgent Care which is expect to open later this year. The backside of the building. 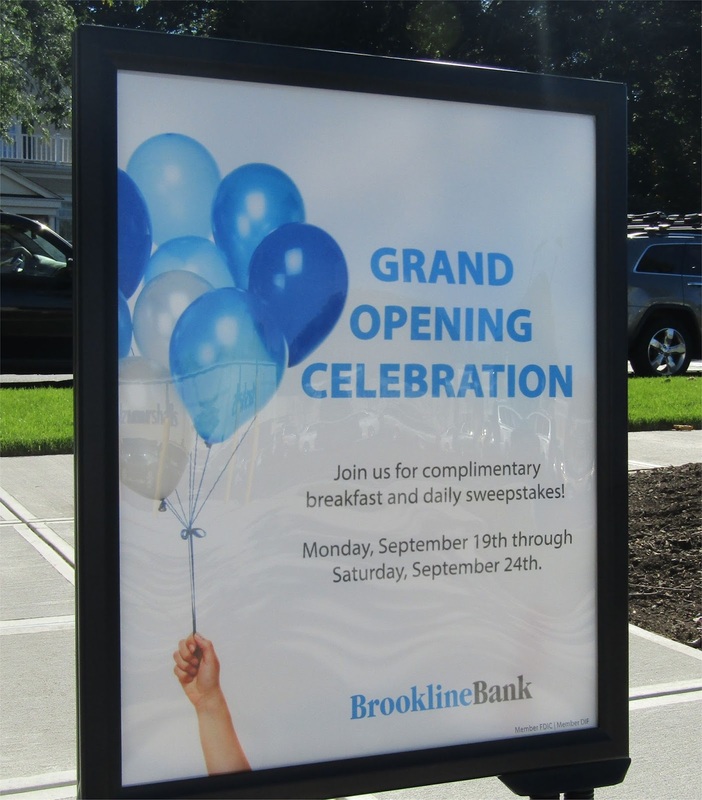 Brookline Bank has signs on three sides of the building. 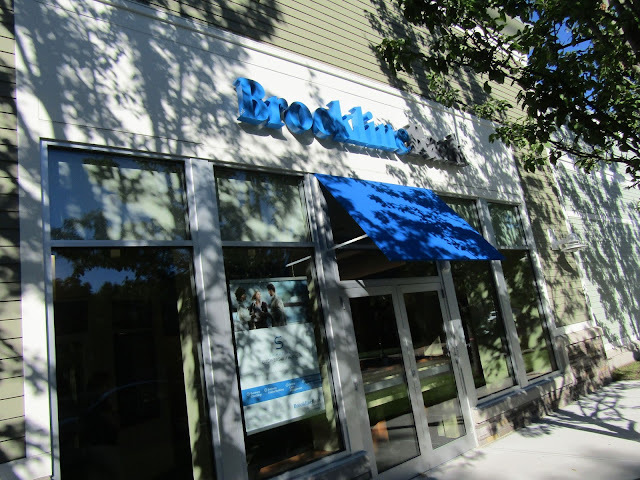 With it's premium location, Brookline Bank should get a lot more exposure. As shown in the above picture, the back of all the stores in the new building face alongside the main access road in to Bedford Marketplace giving it a very industrial appearance. It would be interesting to have local artists paint murals on the back of each retail unit. This would both improve it's appearance and enable artists to showcase their work and also would be a great opportunity for the owners of Bedford Marketplace to get more involved in the local community. Pronails Spa at 305 Great Road in the Great Road Shopping Center, held it's Grand Opening today. The Spa replaces the Radio Shack store which closed in November 2014. This is the 4th location for Pronails Spa. 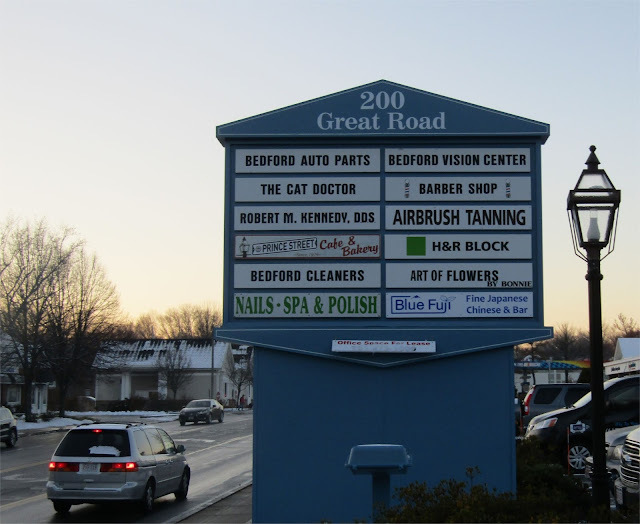 In addition to Bedford, they have two locations in Billerica and one in Braintree. The interior has undergone an extensive renovation resulting in a much more upscale appearance. 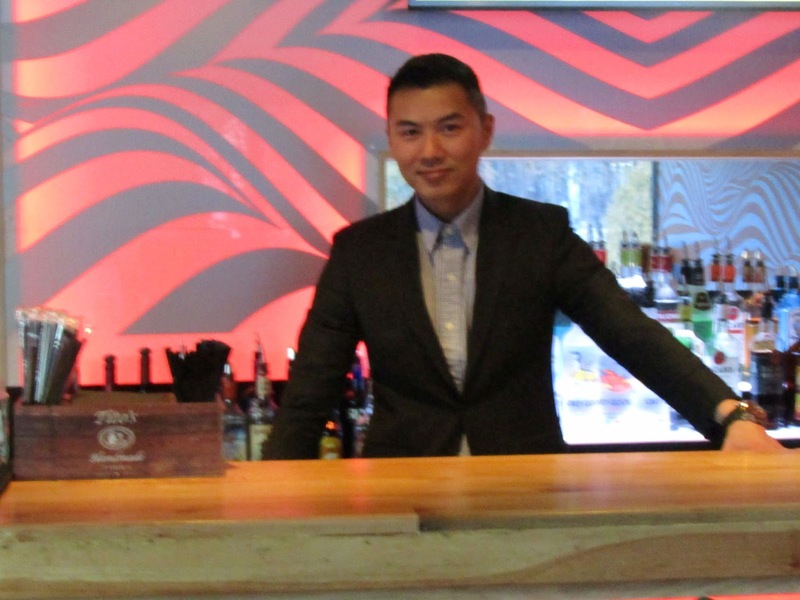 I recently spoke to Tom Phan who is one of the owners. Tom mentioned he has been looking to open an additional location. He started researching other towns when one of his clients who lived in Bedford, suggested they open a location in Bedford. Tom did some additional research and thought the demographics of the town matched up well with their business. Tom has been looking forward to opening and interacting with the Bedford Community. There are over a dozen regular Pedicure chairs. 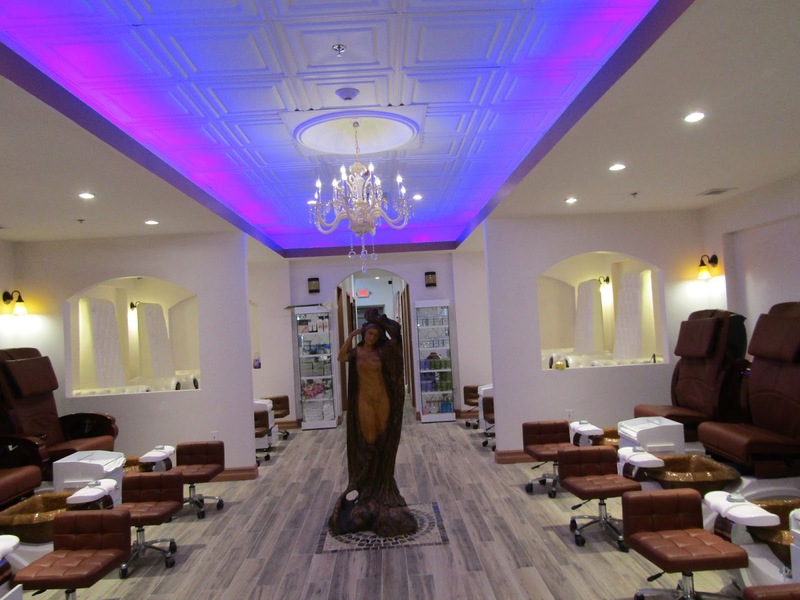 The Spa focuses on Manicures, Pedicures, Facials, Waxing and Massage (which they also referred to as Bodywork). 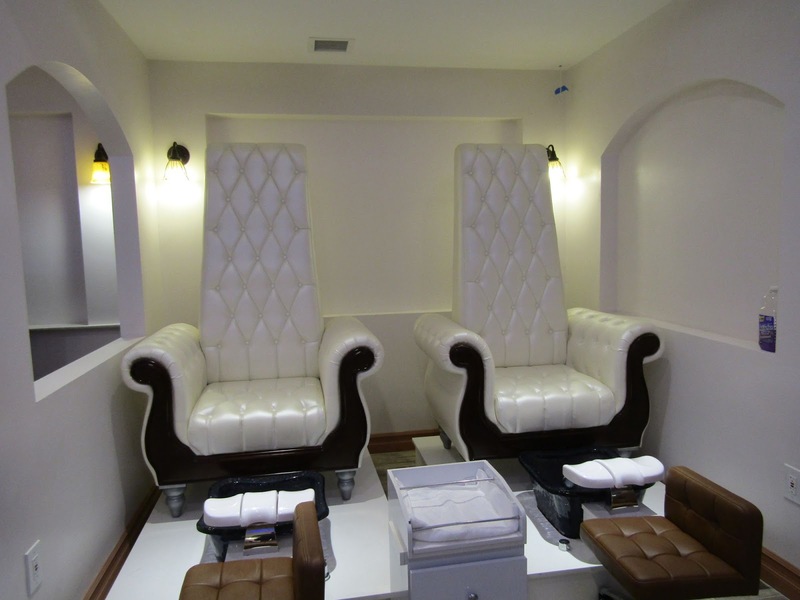 The Spa consists of 20 Manicure Stations and 16 Pedicure Chairs along with several VIP Chairs and two Massage rooms. Clients can choose from several massage treatments including Hot Stone Bodywork, Reflexology and Thai Styles. Along with individual services, the spa also offer private events for occasions such as Weddings and Company Perks/Outings. Special VIP Chairs are available for VIP Services such as Organic Pedicures and Signature Detox Manicures. According to Tom, the Spa is starting with ten employees and hopes to ramp up to about twenty employees after the first few months. will be turned on during colder weather. The Spa is open from 10am to 7pm Mon-Sat and from 11am to 5pm on Sundays. 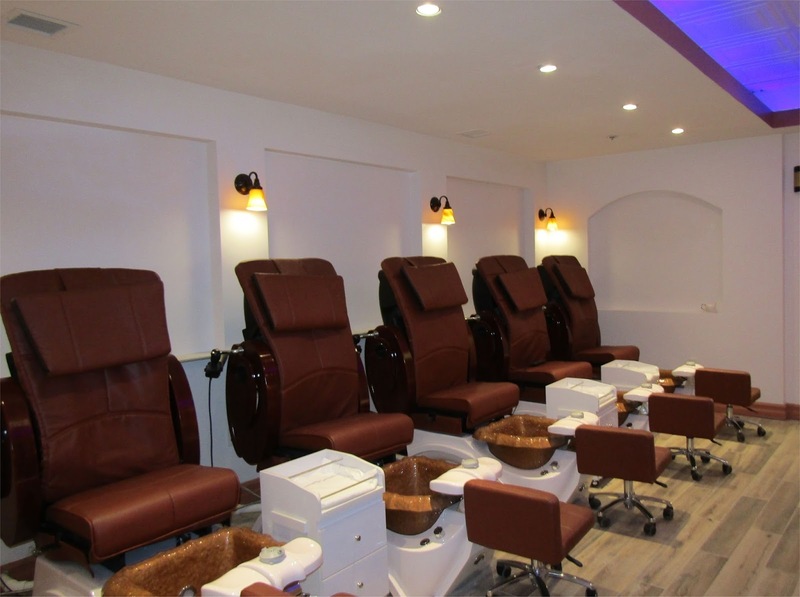 The last few years have seen an increase in Nail Salons and Spa's. I expect this trend to continue in Bedford. 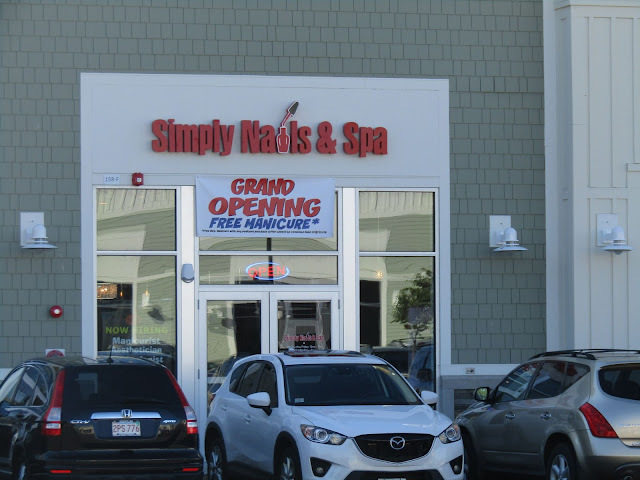 Along with Pronails Spa, Simply Nails & Spa is expected to open next month in the Bedford Marketplace. It will be interesting to see if the additional competition will end up driving more business. 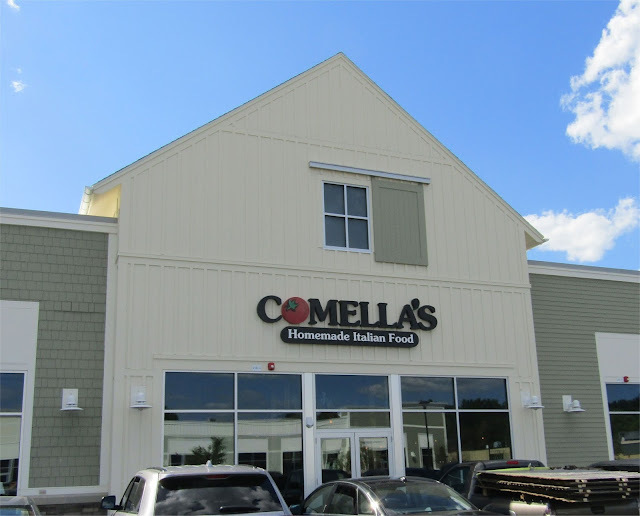 Comella's Restaurant opened June 30th at 158H Great Road in the Bedford Marketplace. With the opening of the Bedford restaurant, Comella's now has 13 locations, all of which are in Eastern Massachusetts. I recently spoke with Matt Comella, co-owner of the restaurant chain. The company was originally formed by his Father, Gene Comella who opened the first location in Wellesley back in 1988. Matt and his brother J.P., joined the business in 2003 and they have been adding locations ever since. According to Matt, the restaurant has 81 seats and has two main sections. A counter service section where you place the order and then food is brought to you (similar to Ken's Deli) and a full service section where you order at the table. This full service section also contain a bar area. 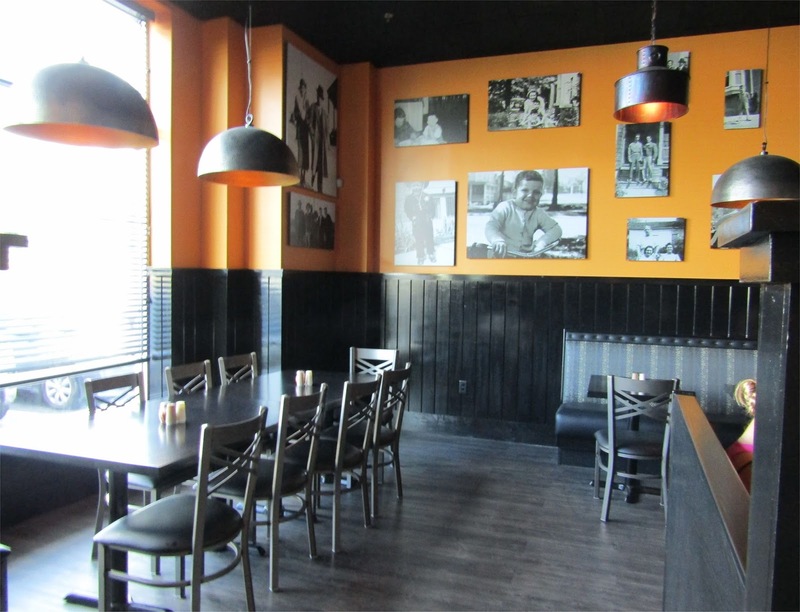 The menu focuses on Pastas, Pizzas, Salads, Sandwiches, Soups, Traditional Italian Entrees and Desserts. The restaurant also has a full liquor license. 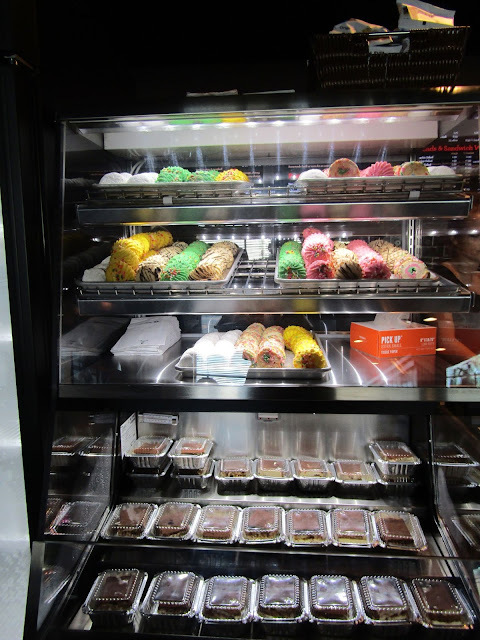 Comella's features a wide variety of desserts including Italian Pastries. Matt commented that Comella's has been interested in opening a location in Bedford for quite a while. They liked the demographics, especially the fact that there are lots of Families in Bedford. Comella's has a history of getting involved in the communities where they operate. Matt mentioned they have already hired a lot of local Bedford students to work in the restaurant. 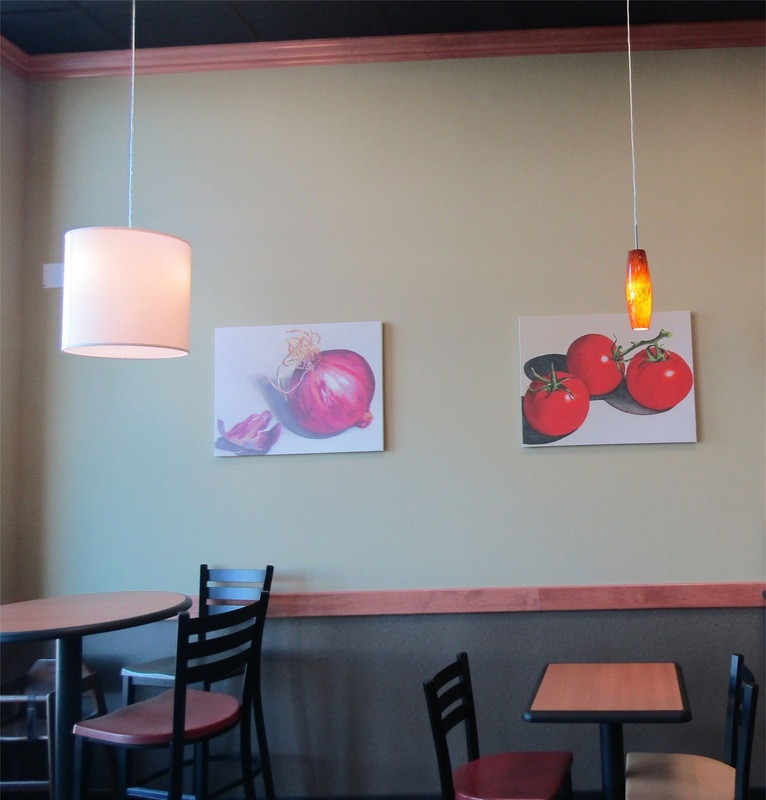 A good portion of the dining areas consists of half booths. Most of the other Comella's have about 20 seats and focus on take out. The Hingham location which opened in May, was the first location to have a full liquor license and larger dining room. 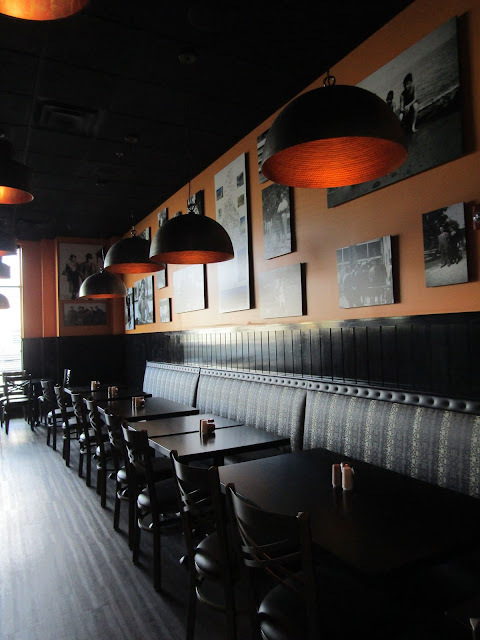 While the Hingham location initially saw most of their sales from dine in, they have been pleasantly surprised to see the takeout business quickly grow to become just as popular as the other locations. This section of the dining room features full service dining. According to Matt, Comella's has a strong commitment on continuous improvement to the taste and quality of their food. They also look at the menu selection and recently decided to add a personal size pizza. 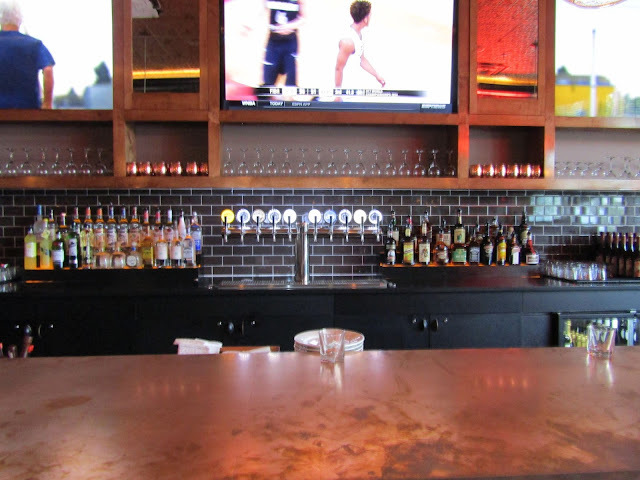 The bar area features a wide assortment of beer on tap along with High Definition Widescreen TV's. Along with online ordering, Comella's also offer corporate catering. The restaurant is currently open 11:30 am to 10:30 pm every day but they will re-evaluate after the summer (Restaurant dining in Bedford tend to quiet down in the summer as many people head to summer homes and vacations). 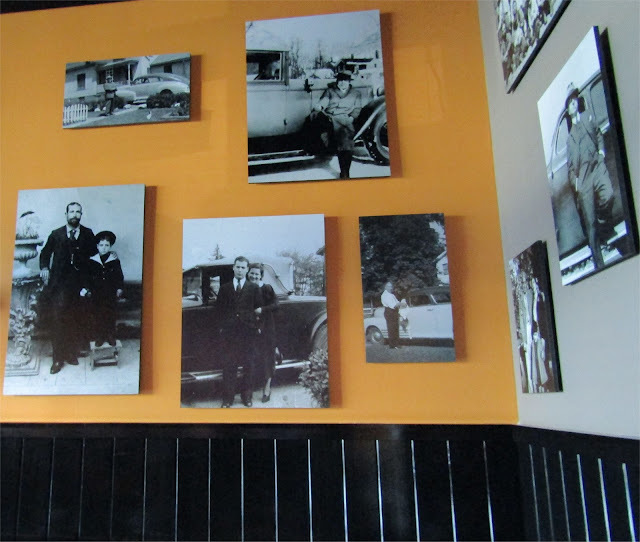 The pictures are on the wall are all real photos of the Comella Family. 1. This is now the 3rd restaurant to open within just a few doors of each other. 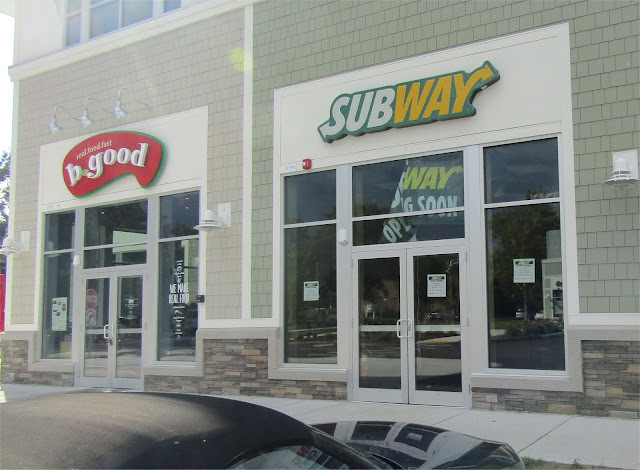 A 4th restaurant, Subway is expected to open later this Month which will create a mini restaurant row in Bedford. 2. It will be interesting to see how many former Cafe Luigi's customers will frequently Comella's. I think they will do very well in that regards. In addition, Comella's is well known for offering a 16" Pizza for $6, which will help drive a strong take out business.